This recently renovated 32 qm apartment is situated on the ground floor of a side wing of an old turn-of-the-century building. Besides a queen-size bed and large wardrobe it offers an all new bathroom with shower, a kitchen with an electric stove, fridge, table, chairs, dishes and all the cooking utensils necessary to prepare a good meal. A washing machine is also included. 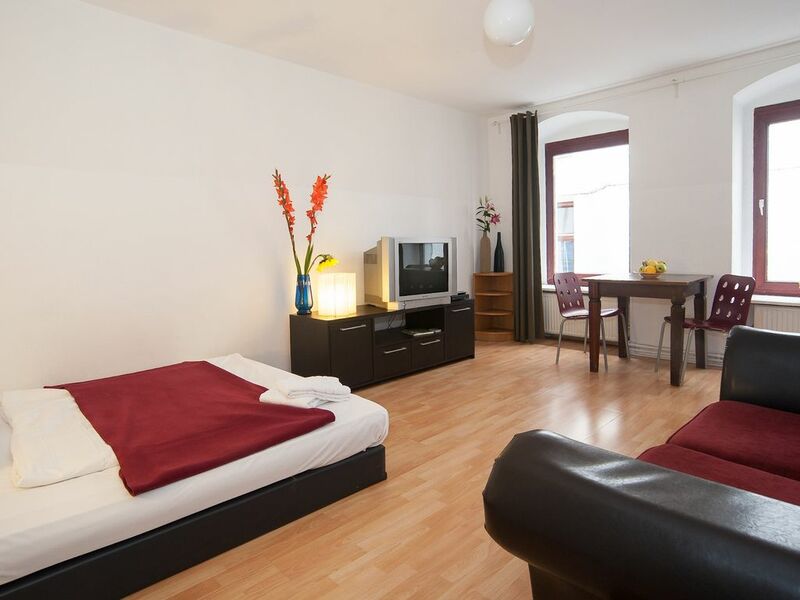 Centrally located between Lehrter Strasse and the so-called Stephankiez in Moabit, the apartment is within close distance to Berlins central station and the Charité university hospital as well as to a wide range of culinary offers and food shopping facilities ranging from fast food to high end restaurants, large supermarkets to 24/7 corner stores. The bathroom is completely new and has a shower, a sink and a toilet. The picture is reflecting correctly the flat. It's clean and totally renovated;Well heated. The bus 123 is an easy way to access the main train station in Berlin. Shops and restaurants are nearby giving easy access to food. Extremely quiet, since it is not on the street, but on an inner courtyard. No noise at all during day or night. We were 3, so we used a comfortable convertible for the 3rd person. The courtyard and entrance are a bit messy with parked bikes, but who cares? Overall, a positive experience ! La photo reflète l'appartement. C'est propre et totalement rénové; Bien chauffé. Le bus 123 est un moyen facile de se rendre à la gare principale de Berlin. Des magasins et des restaurants sont à proximité, ce qui vous permet de manger facilement Extrêmement silencieux, car ce n'est pas dans la rue, mais dans une cour intérieure. Pas de bruit du tout pendant le jour ou la nuit. Nous étions 3, nous avons donc utilisé un convertible confortable pour la 3ème personne. La cour et l'entrée sont un peu en désordre avec des vélos, mais quelle importance? Globalement, une expérience positive ! nice and clean and close to bus lines. Solid kitchen with all the basics. Enter off a courtyard and a little hard to find to hook up with the owner. Wohnung sauber - funktional - ruhig im Hinterhaus Anbindung an den ÖPNV Mit Bus 123 ist man sehr schnell am Berliner Hauptbahnhof Der Bus M27 (S + U Jungfernheide / S+ U Pankow) bedient viele U + S - Bahnstationen auf seinem Weg. Die Haltestellen beider Linien befinden sich so gut wie vor dem Haus. Einkauf In der Nachbarschaft ( max. 10 bis 15 Minuten zu Fuß) befinden sich einige Supermärkte, Spätis, Cafés etc. Die Wohnung war sehr schön alles vorhanden was man braucht. Mit Schlüssel Übergabe und Kaution hat auch alles super geklappt. Wir hatten unsere zwei Hunde dabei auch das war top. Wir waren sehr zufrieden mit allem und können diese Wohnung und den Vermieter nur wärmsten empfehlen. Vielen Dank für Alles. Soweit alles okay , die Matratze war nicht wirklich komfortabel , aber für einen nicht zu langen Aufenthalt bietet die Wohnung alles , was man braucht . Estuvimos una semana en Berlín. El apartamento estaba muy bien situado, ya que en frente hay una parada de bus que en 20 minutos estás en el centro (puerta de Brandenburgo). Todo muy limpio y espacioso. Repetiremos sin duda. Situated between Lehrterstraße and the so-called 'Stephankiez', a pretty Moabite Old Quarter, and just minutes from Central Station and the Virchow Klinikum, the central location of the apartment provides both a convenient transportation and sufficient local infrastructure with a park in the neighborhood , a diverse gastronomy, shopping the big discount stores and shoe shop to small 24 hour corner shop and even a cultural offer (Kulturfabrik Lehrter Strasse). Wir behalten uns die Hinterlegung einer Kaution in Höhe von 200,- Euro in bar vor! Gebührenfreies Parken ist in den umliegenden Straßen möglich. Die Anreise kann ab 15 Uhr, die Abreise sollte bis 11 Uhr des jeweiligen Tages erfolgen. Bei einer späten Anreise wird ein einmaliger Zuschlag erhoben: nach 20 Uhr in Höhe von 10,- €, nach 21.30 Uhr 20,- €, nach 23 Uhr 30,- € (bis 0.30 Uhr). Stornierungsgebühren bei Nichtanreise: bis 28 Tage vor Buchungsbeginn 5 %, ab 27 Tage 20 %, ab 15 Tage 40 %, ab 10 Tage 60 %, ab 5 Tage 80 %, ab 4 Tage 100 % des Mietpreises. ______________________________________________________________________________________ We reserve ourselves the right to ask for a security deposit of €200 IN CASH on arrival! Parking in the area is FREE. Arrival times are from 15:00 until 20:00. Earlier arrivals can be arranged according to the availability of the apartment. Later arrivals will be charged as following: €10 after 20:00 €20 after 21:30 €30 after 23:00 (until 0:30) Checkout time is 11:00 unless otherwise arranged. Cancellation fees are as following: until 28 days before arrival 5% from 27 days on 20% from 15 days on 40% from 10 days on 60% from 5 days on 80% from 4 days on 100% of the renting price.